After the nuclear deal between the P5+1 and Iran over the latter’s nuclear program in 2015, analyses abounded arguing that the agreement signaled a shift: better U.S.-Iran ties would make it easier for India and Iran to take their own relationship forward. However, in 2017, uncertain trajectories in U.S. foreign policy following the election of Donald Trump to the presidency and rising tensions in U.S.-Iran ties, signal instead that India might need to slow down on several proposed projects. 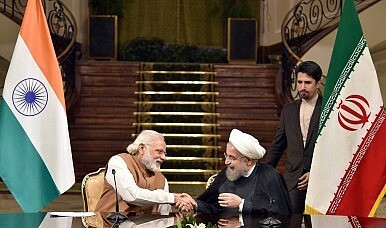 Given these developments, the government of India apparently advised Indian firms to go slow over on investments in proposed projects in Iran’s “Chabahar Free Trade Zone.” An official involved in the project raised the possibility of winding up of the investments plans if Trump imposes more sanctions on Iran. Contractors are also concerned about being paid for their equipment and material supplies for these projects. Projects like Farzad B offshore gas field proposed by ONGC Videsh Limited (OVL) and an aluminium smelter project planned by National Aluminium Company Limited (NALCO) could feel the pressure of the latest sanctions. This could dampen New Delhi and Tehran’s hopes of strengthening regional economic integration after the fanfare with which the Chabahar project was lauded as a big prize for India’s outreach to Afghanistan and Central Asia. Both India and Iran are invested strategically in this project and intend to carry it forward. However, following the Trump administration’s new sanctions on Iran over the latter’s missile program, a new chill has replaced the thaws that were being experienced in many areas in India-Iran relations. More than a decade has passed since Chabahar emerged as an area of cooperation between India and Iran and with the new roadblocks being foreseen because of U.S.-Iran tensions, doubts are being raised on the project’s immediate future. Trump’s hardliner approach to Iran’s regional strategic ambitions was hinted at from the beginning. He has previously categorically stated that dismantling the Iran deal would be his “number one priority.” President Rouhani and Ayatollah Khamenei too have become increasingly belligerent about Trump’s administration. The actions and statements from the U.S. and Khamenei significantly highlights this aspect. For instance, Trump’s “Muslim ban” on visas to the U.S. for nationals from seven countries, including Iran, and later new sanctions on Iran over a missile test, particularly on 25 individuals and companies connected to Iran’s ballistic missile program and those providing support to Iran’s Islamic Revolutionary Guard Corps – Quds Force has only worked as fuel to the fire. This forced Iran to impose its own set of sanctions, which barred 15 U.S. companies from dealing with Iranian firms. Given the economic significance of Chabahar port, rising tensions between Iran and the United States could complicate and jeopardize India’s financial transactions and technology imports from the world, wherein countries like Japan and South Korea are expected to chip in. Chabahar has emerged as a pivotal node in India’s outreach to its extended neighborhood and its Look West policy, that envisions reaching out through trade corridors to the Persian Gulf and Central Asia. Several experts on the issue also have expressed similar fears over India’s plan to invest in the Farzad B gas field, discovered around 10 years back by ONGC Videsh Limited (OVL) due to rising tension between Iran and United States. The other factor in the minds of Indian policymakers is the outcome of Iran’s presidential election in May, which could shape the discourse of India’s proposed investment plans in Iran. Notably, during the visit of Indian Petroleum Minister, Dharmendra Pradhan to Iran, both sides not only agreed to conclude the Farzad B gas agreement at the earliest but also a commitment of $20 billion was given by India to set up petrochemical and fertilizer plants in the Chahbahar Special Economic Zone (SEZ). Both Iran and India should walk the talk in their proposed investment plans as both the Chabahar Port and Farzad B gas field projects are a win-win scenario for the two countries. Questions about the future of the Iran nuclear deal and the outcome of Iran’s presidential election are not insubstantial in relation to India’s investments, but the investments are worth the risk and the nuclear deal too important. While recent developments around the United States and Iran could worsen their relationship further, it will hardly affect the fate of the deal unless Iran itself fails to comply it. U.S. high-handedness could lead to undesirable consequences as stated by Gen. James Mattis. The United States would do well not to be on the other side of the other five other major partners in the deal. As regards presidential election, India can be assured of the fact that whoever is elected as next President of Iran, he would like the nuclear deal to stay alive for Iran’s economic prosperity, which registered 7.4 percent growth for the six-month period ending in September last year. Thus, instead India should take a leaf out of its own book: despite the fear of sanctions it has again submitted a revised plan to invest over $3 billion in Farzad B natural gas block in Iran, which is expected to hold 12.5 trillion cubic feet in reserves, lasting for 30 years. Hence, the intent and will to carry forward the projects like Chabahar and Farzad B gas fields should not be slackened as its benefits will not only accrue to the countries in question but to the region at large. Monish Tourangbam is Assistant Professor at the Department of Geopolitics and International Relations, Manipal University based in Karnataka, India. Manish Vaid is a Junior Fellow with the Observer Research Foundation, New Delhi having research interests in energy policy and geopolitics. Disclaimer: Views expressed in this article are those of the authors.